When I first met Jessica Lipowski, I instantly knew we’d become friends. We connected on Twitter, which has truly become one of my favorite social networks, whether I’m chatting online or meeting new friends offline. In February 2015, I was pleased to announce that Jessica officially joined #CultureTrav as my incredible co-host. And in August 2015, I was thrilled to meet her in Amsterdam. I love telling people how it feels like we’ve swapped lives: Jessica is originally from Detroit, Michigan and moved to The Netherlands in 2011, while I moved to the USA from The Netherlands with my family in 2000. Jessica is a caring friend, a curious world traveler, and an altogether wonderful person. She is a friend you can always count on, someone who goes above and beyond in everything she does, and someone who has been instrumental in fostering our #CultureTrav community. I’m very lucky to have her by my side as a co-host and #CultureTrav partner, and to know I can always reach out to her as a friend, too! And, now, I am proud and excited to announce that Jess is an author. The idea behind her book is an inspiring one, and when she talks about it, her enthusiasm makes you instantly want to pick up the book. Flavors of Life is a collection of biographies from 62 restaurant owners in Amsterdam. What inspired you to write Flavors of Life? Which aspect of writing the book did you enjoy most (i.e. the research, interviews/hearing the owners’ stories, transcriptions, writing, editing, design, all of the above, something else)? Jessica: The idea for Flavors of Life can be traced to one sunny afternoon in August, 2012. While exploring Amsterdam, my partner, Matthijs, and I discovered a Caribbean restaurant. It got us thinking, surfacing several unanswered questions. What makes a Caribbean restaurant, a Caribbean restaurant? What kind of food do they serve? Who is the owner? Is the owner from a country in the Caribbean or just a fan? Why did they open this restaurant in Amsterdam, of all places? These thoughts led us to another realization, reflecting on just how international Amsterdam really is. We heard the statistics outlining how many nationalities call Amsterdam home (180), however, it wasn’t until we looked closer that we saw how diversity has impacted the restaurant scene. Furthermore, I knew why I moved to Amsterdam, but it made me curious why everyone else chose this small, yet beautiful and open-minded city. For a while, I had been tinkering with a few different book ideas, but for one reason or another they just weren’t feasible at the time. When we stumbled upon this Caribbean restaurant, it resonated with me that many others experienced similar dreams. Additionally, we often read reviews, newspaper articles, and Blog posts about the restaurants, specifically detailing quality of the food, friendliness and promptness of the service, and cleanliness of the establishment, yet what is often forgotten is the person who created the experience: the owner. From a young age, I have been captivated by good stories. I love meeting people and hearing about their lives. Combined with my journalistic background and passion for writing human-interest pieces, not to mention my love for fabulous food, I decided to interview international restaurant owners, digging into their history – from childhood to present day – to discover exactly how they got involved in the restaurant industry, as well as how they ended up in Amsterdam. Which part of the process did I enjoy most? Probably interviewing the restaurant owners and getting to know them on a personal level. I felt like I was welcomed into their family, and I am honored to share their stories. Why did you choose to share these particular stories? What unifies them all? Jessica: The 62 people documented in this book are unified by the fact that they all own restaurants in Amsterdam. No matter where they come from, they all share a love for food. How did I pick these 62 entrepreneurs to begin with? I spent about a month deciding which restaurants to interview, looking at a variety of factors including but not limited to cuisine, nationality, and background story if known. How do you think food connects us to local culture? 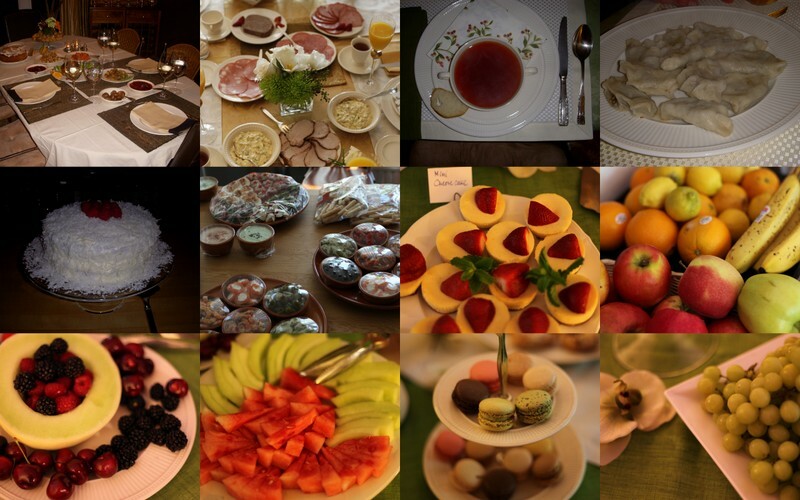 Jessica: Food brings people together and enables us to learn about one another’s culture over a shared meal. First of all, the ingredients communicate information about the society and its history. On a fundamental level it shows what is needed to sustain life in a certain part of the world. Not only that, local specialties indicate what’s in season, availability of certain goods, preferences, as well as how old traditions have been incorporated into modern day times. Flavors illustrate the passion and creativity of a community attempting to colorfully combine ingredients and spices to produce a tasty and hopefully nourishing end result. From a social perspective, the first question often posed in social situations in many countries is, “what would you like to eat?” Food is more than just sustenance. It is also about winning love through the stomach and bringing people together. For many families around the world, offering food is a way to show hospitality, even if they do not have much to share. Being welcomed into someone’s home to share a meal is a great honor in many cultures, and I personally love meeting locals; it’s a great way to hear their stories – over a delicious meal. As an expat, what were some of the things that pleasantly surprised you about Amsterdam (and culinary options) in your first few months there? Jessica: I was surprised to learn Amsterdam is extremely diverse! The Dutch capital is home to 180 different nationalities. That is impressive. The Dutch have a reputation of being tolerant and open minded, and this only adds to the image. On top of that, because the city is so diverse, we have a variety of culinary options. There are cuisines I hadn’t even thought about before, like Afghan. I think that is wonderful that we have so many options available to us. Additionally, I love that although the Dutch like to complain, they make the most of a sunny day. When the sun is shining, you see people sitting outside on terraces and enjoying the simple moments in life. I think that is really important and something everyone can learn from. What do you think makes Amsterdam unique in its worldwide cuisine and cultural footprint? Jessica: Great question! First of all, there is no place in this world like Amsterdam. The picturesque architecture, charming canals, cobblestone streets, meandering streets…. It’s beautiful, and I’m lucky to call it home. The city is also vibrant. There is always something going on – an event, a festival, a rally, a performance, a gathering – and people peacefully co-exist. As I mentioned before, the city is home to 180 nationalities. The Dutch are known for being open-minded and tolerant, and Amsterdam is a prime example. Although the city is small – it is home to less than 1 million people – it has so much to offer! Plus the Dutch are very forward thinking and innovative, leading way to brilliant designs and initiatives. Even though the city – and the country as a whole – is small, Amsterdam leaves its mark on the world. What was the most interesting dish you’ve ever had? Where was it and why was it so unique? Jessica: In Romania, I had the chance to try tripe soup. Many people talk about how disgusting tripe is, namely because the substance is stomach tissue. I had heard of it growing up but never really thought about tasting it. The opportunity never presented itself. It wasn’t until I moved to Amsterdam and started working on this book that the dish piqued my interest. During an interview, one of the restaurant owners started telling me about a friend who frequented her restaurant, eager to try typical dishes from her home country. The owner’s brother was in town and made a pot of tripe soup. The owner had no intention to sell it in the restaurant, it was only for personal consumption, but when her friend came to visit she offered to share. She didn’t know the exact translation in English, and without hesitation, her friend tried it. He absolutely loved it. With only a few spoonful’s left, he declared it delicious and wanted to know the name of it, so he could ask for it again. She finally found the translation and told him, which subsequently changed his opinion 180 degrees. He was appalled and disgusted. When I heard this story, I wondered what kind of dish could do that to a person. When we were visiting a few friends in Romania, I saw it on the menu and had to order it. After the first taste, I knew one bowl wasn’t going to be enough. I was pleasantly surprised and would definitely eat it again, if presented the opportunity. What foods do you miss from the U.S.? Jessica: Macaroni and cheese, Reese’s peanut butter cups, Goldfish, and a good juicy burger! Isn’t it funny how when you are living somewhere, you just take certain items for granted, yet when you move away, they are all you crave? It is the comfort foods that combat homesickness. I know these foods are not healthy, but they bring back fond memories. They bring that piece of home to the Netherlands. Although I do have to note that I recently tried macaroni and cheese again and I felt sick after eating it, so I’ll stay away from that one for a while. What typical Dutch foods have you grown to love, and why? Jessica: Bitterballen and stroopwafels! Bitterballen are small, round deep-fried snacks, crispy on the outside and warm and savory on the inside. The thick gravy-like filling is made from bits of meat, bouillon, flour and butter as well as other spices and seasonings. Bitterballen is usually dipped in a spicy mustard and accompanied by pickles and pickled onions. Stroopwafels: what are stroopwafels, you ask? Dessert heaven. A stroopwafel is the combination of two thin wafer-like cookies with a gooey caramel filling on the inside. Originating in the city of Gouda, the treat started out as a poor-man’s cookie. Now it is one of the most highly regarded sweets in the Netherlands. I always bring these home with me when I visit family; they love them! Jessica Lipowski is the author of Flavors of Life (2016), a non-fiction book detailing the life stories of 62 entrepreneurs from 41 different countries. Regardless of origin or background, one thing unites these people: all own a restaurant in Amsterdam. Jessica, originally from Detroit, Michigan, moved to the Netherlands in February 2011. With previous journalistic work published on 10Best.com (part of USAToday) and in The Washington Times, she is now a published author. The book, in combination with Jessica’s past work experience, travels, and life as an expat, has enabled her to view food, travel, and culture through a different lens. Interested in purchasing the book? 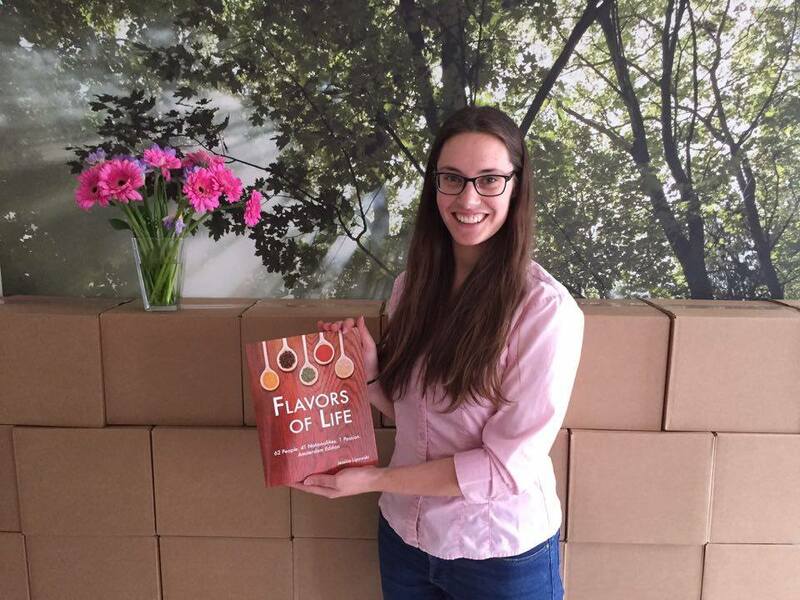 Order your copy of Flavors of Life! Follow Jessica on Twitter, Facebook, and Instagram. Wonderful interview. I am glad we three are Twitter friends, and it was nice to meet you for a literal New York minute (in New York!). I hope to meet Jessica IRL one day. Enjoyed reading this chat with Jessica and her book looks amazing! I love how she explored various aspects of the food culture in Amsterdam. Enjoy what you both do on the weekly Twitter chat! Thanks so much, Valerie! Excited to read Jess’s book, too! And thanks for your kind words about the chat. We love having you there with us! Thank you very much for your kind words! I am excited for you to read the book 🙂 And thank you for being a part of the #CultureTrav community, for making it what it is today. Enjoyed reading about Jessica Lipowski and ofcourse it was interesting to know more about Amsterdam and USA. So glad you feel that way!! 🙂 Thanks for reading and stopping by!